The vertical 10 µm scale bar applies to fig. 2, the horizontal one applies to figs. 5 and 6a. The 100 µm scale bar applies to figs. 1, 3 and 4. Fig. 6b has its own (1 µm) scale bar. Fig. 1. Carposphaera elysia. BSS 28B(IX/1170). See also Pl. 16 fig. 3. Fig. 2. Carposphaera ? mellitosphaera. BSS 28B(II/660). Microsphere excentric (upper left hand quadrant), presumably due to damage. Figs. 3, 4. Carposphaera polypora. The specimen in fig. 3 has a number of centripetal rods originally connecting medullary and cortical shells. BSS 28B(IX/1267) and 28B(VI/512). Figs. 5, 6. 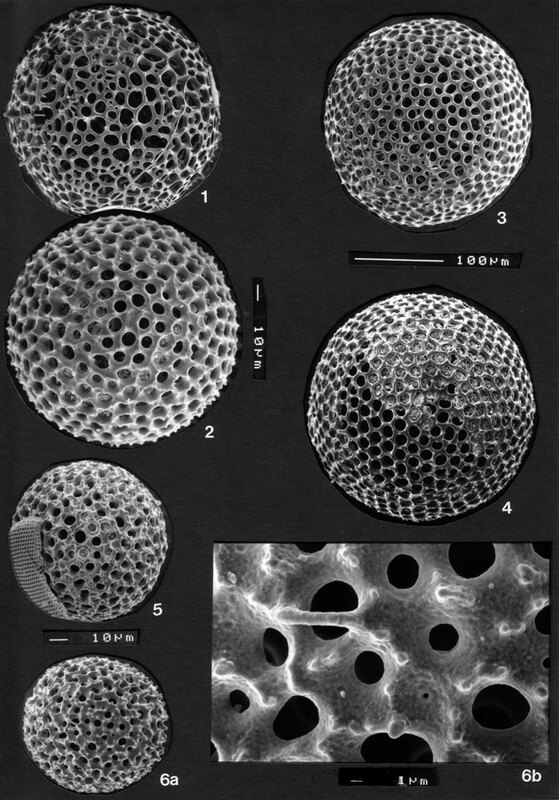 Carposphaera (?) indet. BSS 28B(VIII/1142 and 1004). Fig. 5: Note the thickness of the shell and the cylindrical pores (unlike the funnel-shaped pores in fig. 2). Fig. 6: small specimen with yet thicker shell, smaller pores and longer thorns. Fig. 6b: detail of shell, showing pore-size variation (from 0,25 µm to 4 µm), granular structure (probably due to dissolution) and a single by-spine.